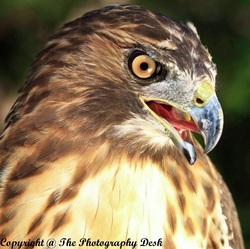 Bubba and Friends, Inc. recovers, rehabilitates, and releases injured and orphaned birds of prey back into the wild. We work under permits issued by the US Fish and Wildlife Service and the Georgia Department of Natural Resources. We are a 501c3 exempt nonprofit organization. 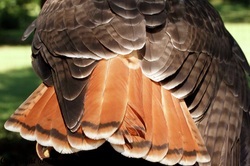 We work with DVMs who donate their time and expertise to provide the best medical care to our raptors. 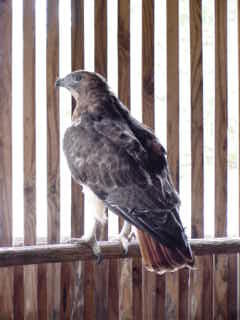 Bubba was a Redtailed Hawk who sustained a broken pelvis in a collision with an automobile. Since the injury rendered him unreleaseable to the wild we opted to try him as an educational ambassador. Not only did he adapt quickly he excelled with a calm demeanor and unflappable temperament. We received a call from a school to present an educational program about raptors. The teacher presented us to her class as Bubba and His Friends. A couple weeks later another teacher called and wanted Bubba and his Friends to visit her school. She did not tell us about the newspaper photographer who was going to be there for the BIG field day! We had a great time with students and staff. The biggest surprise was the front page of the Griffin Daily News with a picture of "Bubba and Friends" with a big writeup. So we were named. In 1995 we incorporated and added Inc. to our name. During all this official stuff the eagles, ospreys, hawks, owls, falcons, and vultures were pouring in..... along with a few surprises! Mr. Paul Powers- friend and photographer, check out his gallery on his facebook page. Amyjon Rogers , along with Tom and Micah,friend and photographer check out her work @ www.pcboatphotos.com. Becky Watts- editor of the best newspaper around www.pikecountytimes.com. She still carries B&F,I stories.